Northern Niger has long been marked by instability and tense relations between citizens and the government, including military forces. The Agadez and Tahoua regions, which harbor the country’s vast uranium resources and most important mining sites, have repeatedly experienced conflicts among traditional pastoralist societies, growing urban communities, mining companies, and central authorities over issues such as the use of land and water resources and the environmental impact of the mining industry. These challenges have been exacerbated by an increasingly volatile security situation in the Sahel -- an arid region of Sub-Saharan Africa south of the Sahara desert. At the crossroads of century-old trade routes, Agadez has become a center for the trafficking of migrants to Europe, arms and drugs. 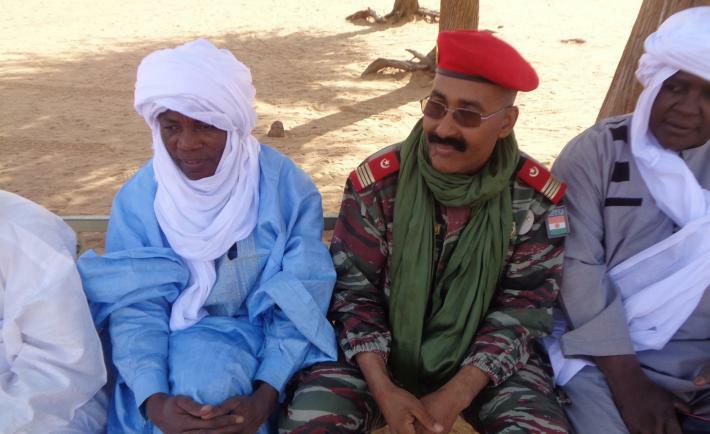 Since the eruption of Mali’s armed conflict and increased incursions of Islamist terrorists into Nigerien territory, the government of President Mahamadou Issoufou has stepped up the presence of military forces in the north. Meanwhile, many citizens feel disenfranchised and frustrated over what they perceive as the government’s failure to provide basic services. Prior to Niger’s February 2016 legislative elections, NDI organized a series of forums where citizens discussed the priorities in their communities with political parties and their local candidates.The forums and ensuing meetings revealed increasing tensions between Niger’s military and the population in the area. How to get to YES: a venn-diagram can be a useful tool to formulate areas of agreement among opposing sides during intense negotiations. Ending ethnic conflict, opening up the economy, creating jobs and adopting constitutional reform are very large tasks looming in Burma’s future. Building consensus with minority parties also will be critical for the big changes that the Burmese must enact. But it would be a mistake to bet against a country of such beauty and tremendous natural resources, which welcomes you with a warm mingalaba (how are you doing!) greeting in each encounter. Today’s youth are at a critical juncture. The current young generation - the largest in global history - is disproportionately affected by unemployment, insufficient access to education, violent conflict and a number of other challenges. Eager to play a role in changing their communities and nations for the better, many young people have become frustrated with political processes that seem out of reach, out of touch and ineffective, and have since turned to other ways to give back to their communities. To encourage youth to “opt-in” to the state, governments need to give them more than a seat at the table to address matters affecting their lives. Failure to do so may further widen the growing rift between youth and political institutions, and make youth more vulnerable to recruitment by extremist groups. One person is forced to flee their home every second according to the International Displacement Monitoring Center. The current estimated number of refugees and internally displaced people (IDPs) around the world is 65.3 million, a number equivalent to the total population of the United Kingdom. These numbers show that new and protracted crises are driving people from their homes at an alarming rate. Humanitarian systems devote huge efforts to ease refugees’ suffering, specially focused on providing basic needs like food and shelter. Though these interventions are crucial, political participation for refugees and IDPs is also important and can be the first step to finding viable long-term solutions for their plight. “What will people think of us when they look back and find that in 2017, Wikipedia only had 16.97 percent of its biographies about women? 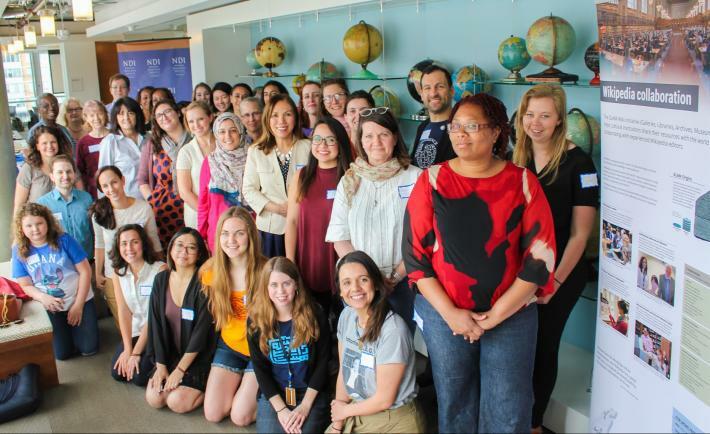 They’ll say ‘shame on them,’” said Wikimedia-DC’s Rosie Stephenson-Goodknight at NDI, Wikimedia-DC and the Women’s Media Center’s first joint edit-a-thon. Wikipedia is the main online encyclopedia of our digital age. Openly sourced from the public, one might expect a nearly equal rate of women’s representation on Wikipedia—but it’s not even close. As Stephenson-Goodknight noted, only 17 percent of biographies on Wikipedia’s English site are of women, and it’s an even lower number on most of the site’s other 295 languages. Participants in Moldova’s Challenger program canvass and get out the vote for parliamentary elections. 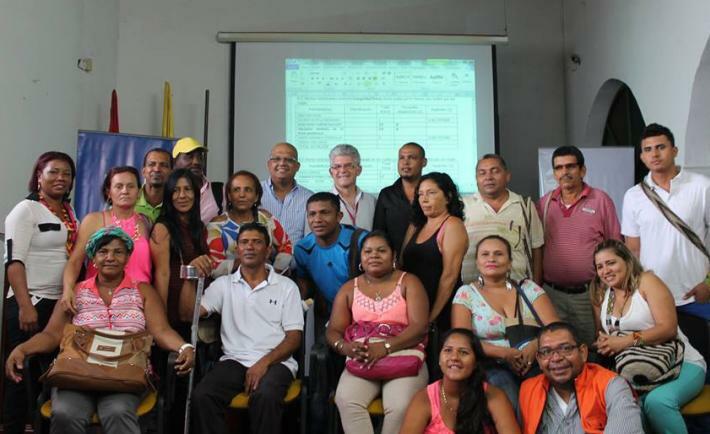 What helps citizens succeed as political leaders and activists? Beyond providing technical skills and tools, NDI has noted that developing certain attitudes and behaviors can help citizens participate more meaningfully in public life. Young political activists have consistently mentioned the need for improved “soft skills” to work effectively and succeed as leaders. USAID and other donor agencies are also recognizing the importance of putting these skills at the center of human development. 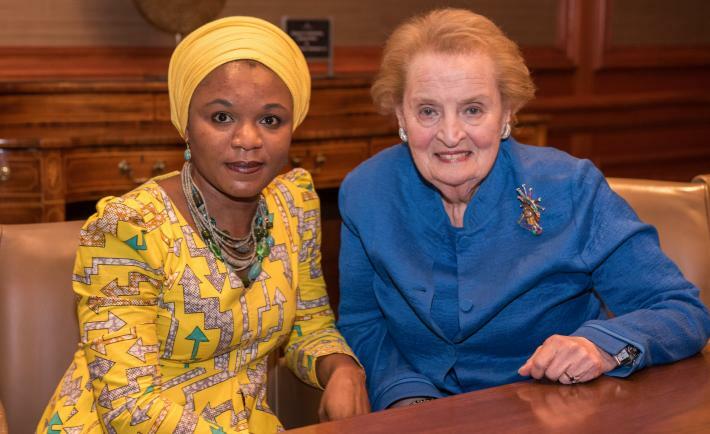 2017 Andi Parhamovich Fellow, Ashley Dauda, with NDI Chairman and former Secretary of State Madeleine K. Albright at NDI's annual MKA Luncheon. I recently attended a conference on ‘the Political Economy of Gender and Women’s Empowerment in Africa,’ organized by the School of Advanced International Studies at John Hopkins University. Gretchen Bauer, a Professor of Political Science and International Relations from the University of Delaware, held a presentation on the global ranking of women’s representation in national parliaments. As Bauer passed through the slides of her presentation, I didn’t bother to look for Nigeria since I already knew where we stood on the list globally: 181 out of 191—the lowest in Africa. 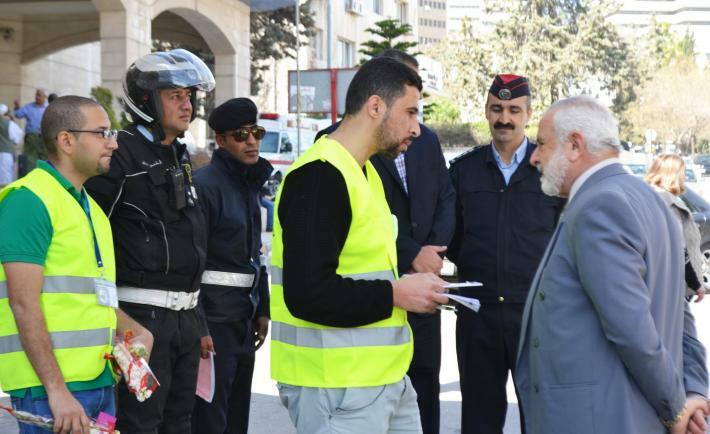 Usharek+ participants in Jordan launch their advocacy campaign with the goal of improving traffic safety. 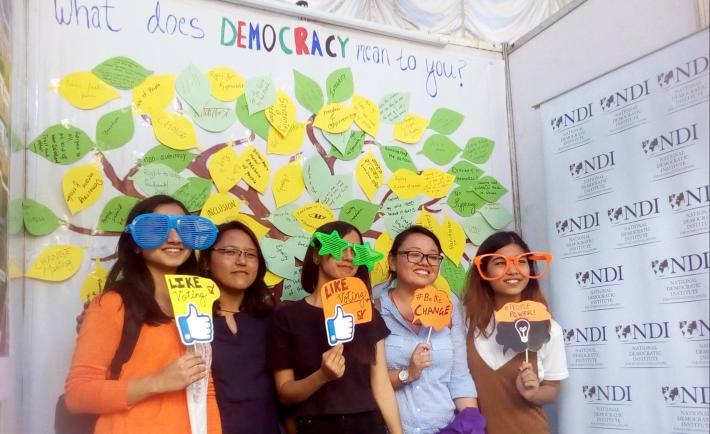 NDI’s new theory of change unifies important elements of youth political participation programs and depicts how they can interplay to change practices of youth participation. This theory, which I blogged about last month, was not merely academic exercise from the “ivory tower.” It draws on discussions with young politically active women and men across Africa and Latin America, collaborative discussions with democracy and governance practitioners from around the world, and deep reviews of effective youth programs NDI is conducting in Jordan and Kosovo. 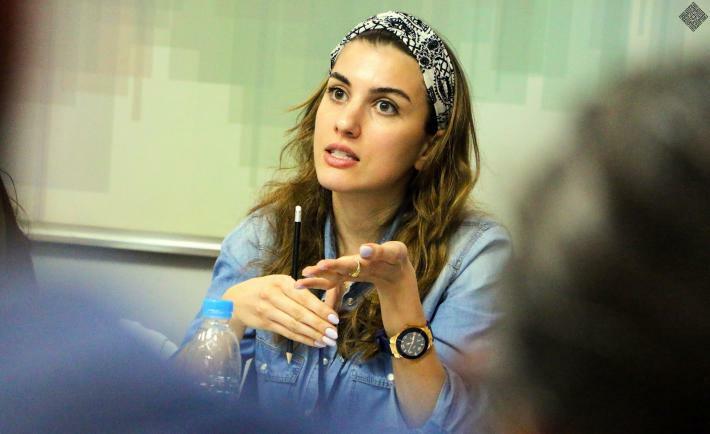 The Jordan and Kosovo programs show how the theory of change can play out in practice. 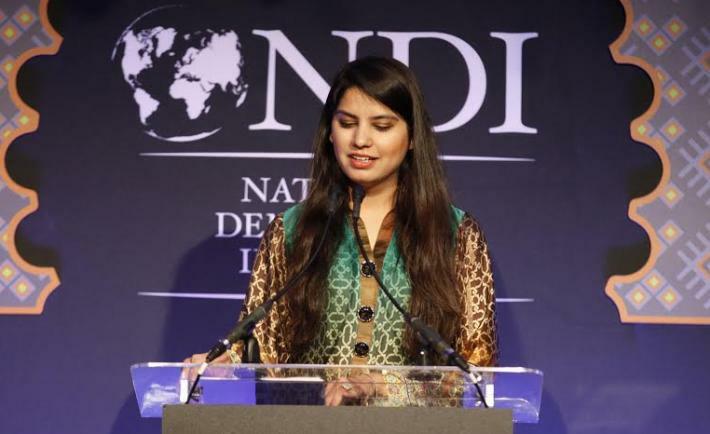 Sehrish Naseem gives a speech at NDI's annual Madeleine K. Albright Luncheon in 2016. How did I come to understand what has become my mission in life? Well, I come from a social context in Pakistan where, like in all developing countries, women’s vision and committed approach to a practical life goes through tough challenges. It can even start within a woman’s own family. Fortunately, my family stood by my ambition of joining social work as a profession.